Earlier this week, one of the most followed streamers on Twitch, Pokimane, surprised viewers by kicking off her stream sans makeup. On Monday, the Fortnite player, podcaster, and IRL streamer decided she’d walk her fans through what it takes to do her makeup for one of those streams. It ended up touching off a wide conversation about women, makeup, and unrealistic expectations. What happened next was, given the nature of the internet, inevitable: a barrage of insults pointed Pokimane’s way from men and teenage boys. Fortunately, this was quickly followed up by a wave of support for Pokimane, as fans and other streamers rallied behind her to point out that that people’s expectations were unreasonable, and that nobody’s face is naturally up to society’s absurd standards all the time. “People shocked about how Pokimane looks w/o makeup just outing that they probably haven’t had a girlfriend. Even worse outing that they’ve never had a female friend consider them close enough to hang out with no makeup on. Big yikes,” said League of Legends analyst Mark Zimmerman. “If all these internet kids are surprised that Pokimane looks different without makeup, they’re going to be really surprised what I look like when I have yet to feast upon the blood of innocents to preserve my eternal life that day,” said game designer and streamer Brian Kibler. 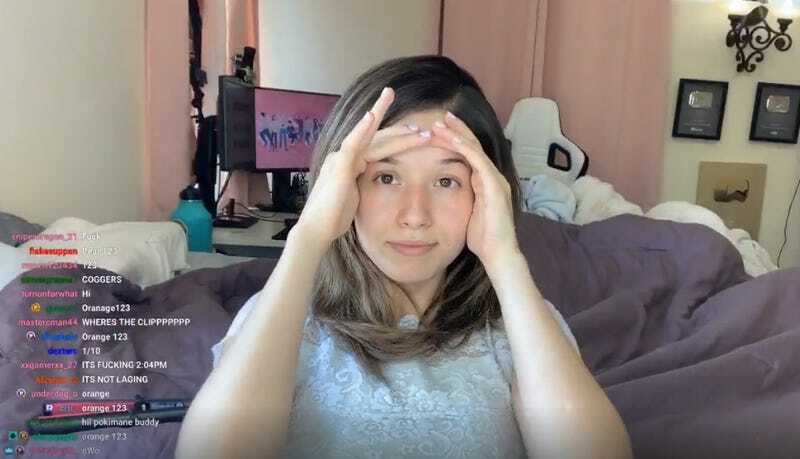 Other women streamers even began posting pictures of themselves without makeup, in order to demonstrate how much effort goes into it and that—shock of all shocks—they, like Pokimane, look different with and without makeup! “This is gonna sound crazy but...did you KNOW that girls aren’t born with black lines on their eyes, their skin isn’t flawless, and get this, their hair isn’t perfect when they wake up either???? WOW THIS IS SUCH CRAZY NEW INFO FASCINATING DISCOVERY,” said Twitch and Discord partner Girlwithyellowspoon in a tweet accompanying makeup-free pictures of herself. Men having unrealistic expectations of women’s appearances is hardly a new thing, but one of the central selling points of Twitch is the perceived accessibility of streamers. Viewers can, in theory, spend whole mornings, afternoons, or even days with their favorite streamers, getting a front-row seat to intimate spaces like their homes and bedrooms. That does not mean, however, that streamers can just let their hair down on stream. It may seem like they’re your virtual pal kicking back, having a laugh, and playing video games, but it’s a performance—one that can take a toll over time. This goes double for women, who are expected to look all at once flawless and natural, so as not to break the illusion that they’re just regular people chilling out. “When it comes to online personalities, especially popular ones, they’re often held to the same standard as your typical entertainment celebrity. In short, all perfect all the time,” Miisty told Kotaku in a DM. Both Miisty and Tiger Lily decided to post pictures of themselves because, among other reasons, they didn’t want Pokimane to feel like she was staring down the inconsolable hordes all by herself. Though the experience can’t have been pleasant, Pokimane seems to be taking things in stride, reacting to a comment from a pro Halo player about how she’s “hoarding the world’s greatest skin care routine from the rest of us” by posting her whole skincare routine and thanking her supporters. “I’m at peace with myself, my body & my imperfections, and I wish the same someday for anyone who feels the need to hate on someone else for such shallow reasons,” she tweeted yesterday.